A seep hunting and geochemical campaign can provide economic and cost-saving benefits to most exploration programmes, especially in frontier, unproven regions. Seeps bring hydrocarbon-rich fluids from the deep subsurface to the seabed where they can be accessed for geochemical sampling. The resulting analyses can provide a wealth of information on the type and contents of a reservoir at depth. In a well-designed programme, gas, condensate and oil signatures may be distinguished from each other and used to refine and reduce the scope of further exploration work, make final investment decisions, farm-in or farm-out, and guide preliminary production design. Cost savings can be in the order of tens of millions of dollars (e.g., in reducing a 3D exploration seismic programme footprint) or much more – even avoiding a dry exploration well. The technology used to find offshore seeps (and the experience of scientists who employ that technology) is rapidly evolving, making seep hunting an exploration technique that continually improves. How are Hydrocarbon Seeps Expressed on the Seafloor? 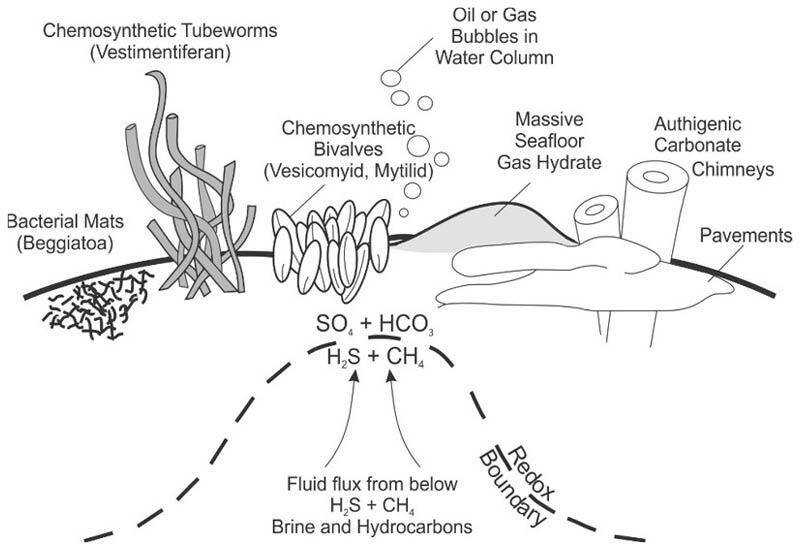 A schematic of a typical seafloor chemosynthetic community at the surface seep location. Note the steep geochemical gradient depicted below the community – if the sample is not properly located, the good geochemistry will not be obtained, and the results will most likely be inconclusive. Fugro. Onshore hydrocarbon seeps are easily identified visually and have been used for exploration purposes for more than a century. Finding offshore hydrocarbon seeps – in the absence of prolific oil seepage that leads to formation of sea surface slicks such as in the Cantarell Field in the southern Gulf of Mexico – is much more challenging. However, over the last few decades, technology has advanced significantly to allow for detection of both active and inactive seeps, even in deepwater. The driver of that technology has been the multibeam echo sounder, the rapid recent advances in that technology, and the skill of scientists in exploiting the resulting data for maximum utility. Chemically-reduced seep fluids rise from depth and encounter oxygenating fluids near the seafloor surface. The chemical reactions that occur can lead to the precipitation of minerals in place (such as authigenic carbonates) as well as mineral-rich fluids capable of supporting life, from sulphur-consuming microbes to the molluscs and clams that come to dine on them. These chemosynthetic communities are typically discrete and focused around the channelised seeping pathway (e.g., fault, mud volcano). They also differ significantly from the surrounding seafloor in that they are hard surfaces and thus acoustically highly reflective. 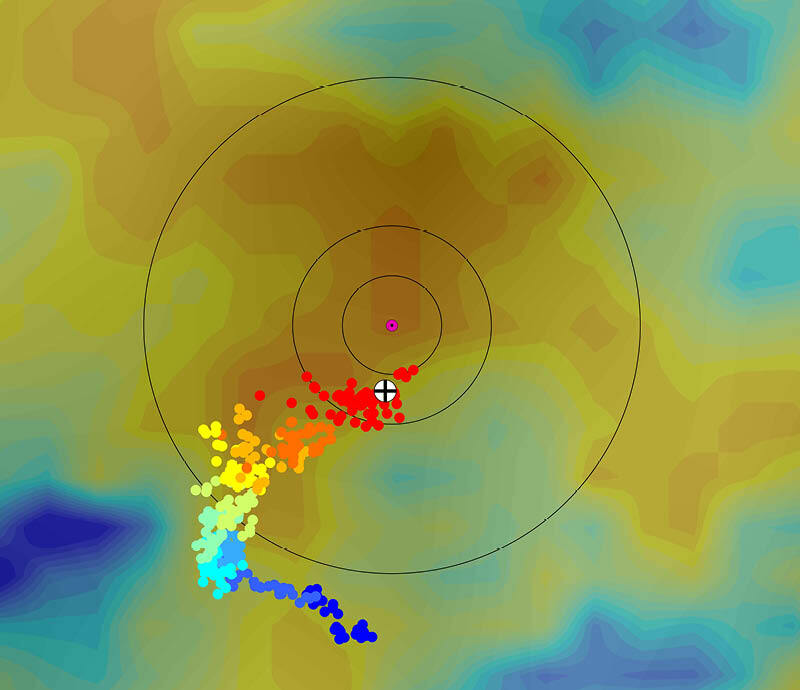 Enter the use of the multibeam echo sounder to acquire data enabling us to find them. When present, water column anomalies (in white) can be extracted from the MBES dataset. Fugro. 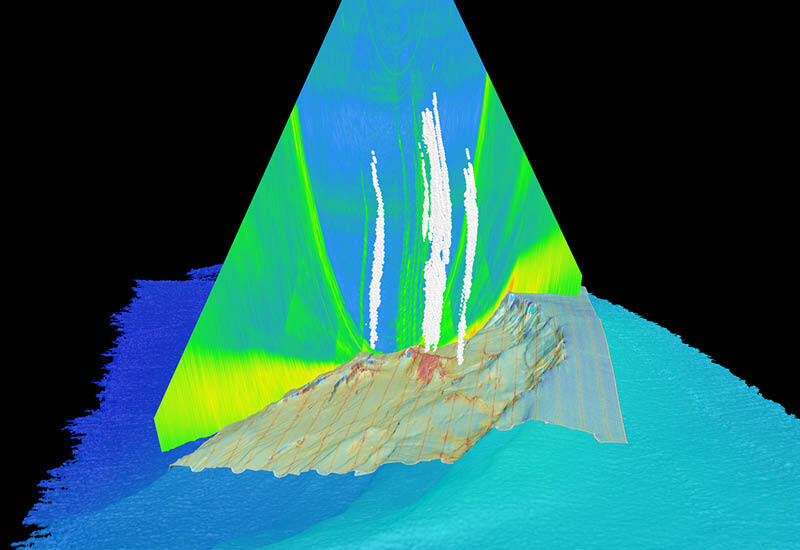 The primary technological driver allowing surface geochemical surveys to advance into the modern age, and to proliferate – despite the recent sizable market downturn – has been the evolution of multibeam echosounders (MBES), which are used to accurately map swaths of seafloor by acoustic signals (pinging) from fast survey vessels. MBES technology is still rapidly evolving, with each new generation being much improved over previous models, and with constantly improving software/processing capabilities too. The most recent systems measure nearly five times the sounding data compared to the previous generation and can dual ping and acquire data in the water column as well as the seabed. The technology continues to improve as MBES manufacturers like Kongsberg attempt to meet and exceed the technical challenges imposed by operators such as Fugro, who are actively pushing the envelope in the survey and the seep worlds. The datasets generated and interpreted by experienced MBES users have significantly improved the success of surface geochemical surveys. This is what Fugro calls ‘Seep Hunting’: skilled geoscientists using MBES data to interpret seabed geomorphology and hardness/rugosity (using backscatter) and to detect gas bubbles in the water column (see image above). Trained, specialised geoscientists can now identify metre-scale hydrocarbon seeps in thousands of metres of water as the vessel is surveying over the feature. Significant attention must be applied to properly calibrate the MBES as the data are crucial for remote seep detection (e.g., Mitchell et al., 2016). Older geochemistry programmes with no multibeam data were often considered scientifically inconclusive before quality MBES mapping and interpretation. However, recent industry exploration projects now routinely adopt this methodology and gain meaningful data to successfully drive their exploration strategies. Real-time monitoring of a USBL-navigation beacon attached to the piston-coring assembly. The trace of the core’s descent from sea surface (dark blue) to seafloor (red) is superimposed over the backscatter map. Fugro. Skilled interpretive geoscientists on board are key to an optimal programme. They control not only QA/QC of MBES acquisition and processing but can make judgement calls as to whether an area warrants another pass for improved data quality. Seabed seep features are ephemeral, small, discrete, and hard to sample, so shipboard geoscientists continuously refine targets and use ultra-short baseline (USBL) navigation to guide a piston core so it may be sampled precisely (see image overleaf). When they examine core samples, they can again make decisions in the moment as to whether another core would be advisable. They also can quickly select key portions of the core for further laboratory geochemical analysis, minimise the chance of sample contamination, and maximise the preservation of the more volatile hydrocarbons. Case studies demonstrate how this type of approach – compared to historic industry success rates – can double the likelihood of recovering samples bearing evidence of migrated liquid petroleum and thermogenic gas (Bernard et al., 2008; Orange et al., 2008; Gharib, 2009). Shipboard geochemical screening analyses, such as that currently conducted by Fugro, include gas chromatography for C1–C5 and total scanning fluorescence for aromatic hydrocarbons. Samples with evidence of thermogenic hydrocarbons are then selected for additional analyses (in shore-based labs) which includes C15+, followed by advanced analyses including stable isotope compositions and biomarkers. There are many advantages in conducting screening analyses offshore, in addition to near-immediate availability of geochemical results. Optimising locations to return to in order to undertake additional coring while the vessel is still deployed can save millions of dollars in mobilisation fees. Furthermore, the samples for additional testing are identified before the vessel returns to port, meaning they can be shipped immediately to a lab for advanced tests, rather than waiting for shore-based screening results. 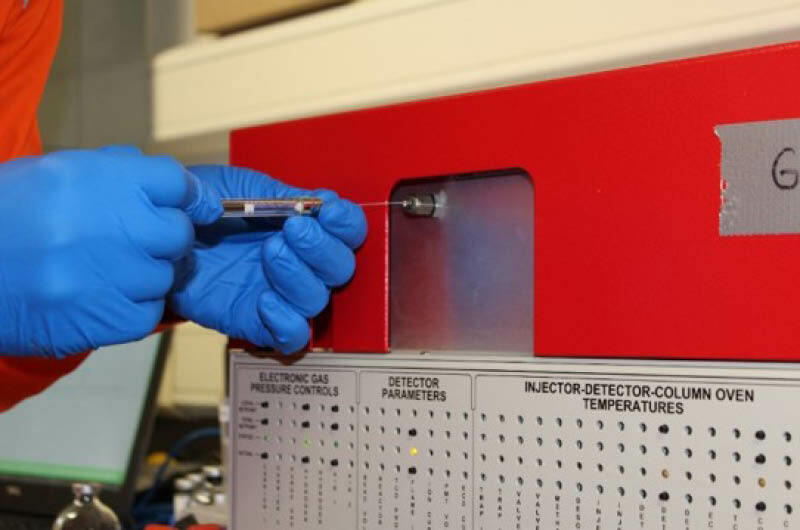 Within a few hours of sample recovery, headspace gas can be extracted and analysed on a gas chromatograph for preliminary geochemical results, which help guide additional sampling. Here, headspace gas is being injected by a trained geochemist. During the last 15 years, Fugro has performed over 100 seep hunting surveys and geochemical campaigns covering over 2,000,000 km2 and acquiring thousands of cores and heat flow measurements. Fugro’s seep hunting business has grown 14% year on year for the past 15 years; more notably, the business has grown 30% each year since 2010, including the years since the 2014 downturn. The industry clearly recognises the value for money in carrying out seep hunting and geochemical campaigns. In addition to high-grading future exploration activity by specifying a smaller area to carry out additional, more expensive, exploration work, the high-quality bathymetric data are useful for shallow hazard assessments and development planning. Executing a seep hunting campaign in a frontier, prospective location also provides data that companies can use to attract farm-in (cost-sharing) partners or make confident decisions on acquisition or divestiture of lease blocks: decisions with major impacts on their future financial health. Furthermore, seep hunting surveys can easily be combined with other early-field work such as an environmental baseline or metocean studies, leading to reduced total vessel time and fewer mobilisations and demobilisations, yielding even higher value to cost ratios for energy industry stakeholders. The technology of MBES and interpretive tools for its data continue to improve, making it likely these will be the primary tools for seep hunting for some time. That said, exciting new technologies are emerging that will complement and expand our current capabilities. Underwater cameras can directly image seeps, while chemical sensors, such as mass spectrometers and fluorometers, are capable of ‘sniffing out’ specific compounds in the water (e.g., Villanova, 2009; van Graas et al., 2018). MBES systems mounted on autonomous underwater vehicles have already been applied to deep seafloor surface geochemistry (e.g., Wynn et al., 2014). Ultimately, miniaturisation of MBES systems, allowing for their integration with smaller, unmanned surface vehicles and/or gliders, will allow seep hunting to occur in locations previously inaccessible or where hull-mounted seep hunting would be inefficient, like very shallow water. Relative to other methods such as 3D seismic, seep hunting is an economically-sensitive method for hydrocarbon exploration. The benefits of its results will continue to illuminate the resources and diversity of the seafloor for decades to come. Bernard, B.B., Brooks, J.M., Baillie, P., Decker, J., Teas, P.A., and Orange, D.L., 2008. Surface geochemical exploration and heat flow surveys in fifteen (15) frontier Indonesian basins. International Petroleum Technology Conference. Gharib, J., 2009. Offshore seep hunting – modern technology catches up with an old science. Dew Journal, October. Mitchell, G., Orange, D.L., Gharib, J., Kennedy, P., Improved detection and mapping of deepwater hydrocarbon seeps: optimizing multibeam echosounder seafloor backscatter acquisition and processing techniques. Marine Geophysical Research. doi: 10.1007/s11001-018-9345-8. Orange, D.L., Teas, P.A., Decker, J., Baillie, P., Gilleran, P. and Levey M.D., 2008. The Utilisation of SeaSeep Surveys (a defense/hydrography spinoff) to identify and sample hydrocarbon seeps in offshore frontier basins. International Petroleum Technology Conference. van Graas, G.W., Ulas, M., and Schønning, J. R., 2018. A newly developed method for detecting petroleum seepage using surface geochemical exploration. GEOExPro 15 (3). Villano, M., 2009. A deep-sea chemical-sniffing bloodhound. Woods Hole Oceanographic Institute Oceanus Magazine 47 (2). Wynn, R.B. and 13 others. 2014. Autonomous Underwater Vehicles (AUVs): Their past, present and future contributions to the advancement of marine geoscience. Marine Geology 352. doi: 10.1016/j.margeo.2014.03.012. Some recommending reading from GEO ExPro relating to, or similar in content to, seep hunting and the use of geochemistry in the exploration of oil and gas. The Deepwater Niger Delta: An Underexplored World-Class Petroleum Province. Regional, deep-penetrating 2D seismic data is imaging new petroleum potential in this prolific province.